Added on 02 January 2019 . By Anisah Audu. 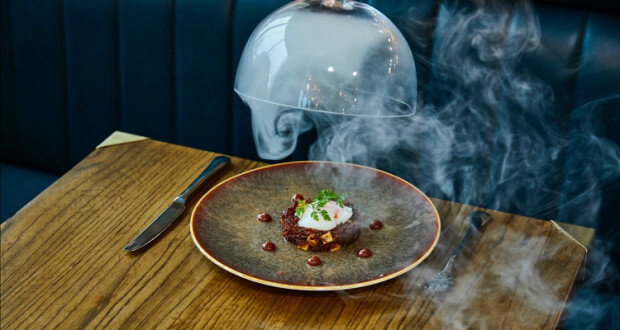 Inspired by the Roman fort of the same name, Mamucium is serving up a taste of modern British dining in Hotel Indigo. Cosy leather seating, subdued lighting and golden hues create a swanky space; from the restaurant through to the bar and cafe. Expect an open-plan kitchen and contemporary twists on much-loved food and drink. With chef Andrew Green at the helm of the menu, this slinky spot is serving up a northern take on English staples. Think freshly baked bread, Lancashire onion soup and Cheshire beef. Wash it all down with classic cocktails and a few newbies inspired by historical moments in British history. If that's not enough, then the carefully curated wine list and craft beer selection should do it.